McKeel has won four elections for the Jack Jouett seat on the Albemarle School Board. 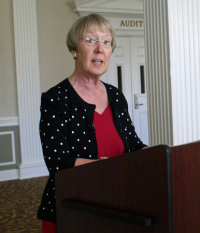 McKeel received the endorsement of the Albemarle County Democratic Committee in September 2013. ↑ Web. Democrats gain advantage on Albemarle County Board of Supervisors, J. Reynolds Hutchins, Daily Progress, World Media Enterprises, November 5, 2013, retrieved November 5, 2013. ↑ Web. Palmer wins re-election to Board of Supervisors, Julie Zink, News Article, Charlottesville Tomorrow, November 7, 2017, retrieved November 7, 2017. ↑ Web. McKeel to chair Albemarle Supervisors in 2017, Sean Tubbs, News Article, Charlottesville Tomorrow, January 4, 2017, retrieved December 25, 2017. ↑ Web. Albemarle County, Virginia State Board of Elections, retrieved November 11, 2013. ↑ 9.0 9.1 E-mail. Schermerhorn, Clarice, Elections Manager, Albemarle County. "Official Results November 3, 2009 General Election.." Message to Charlottesville Tomorrow. 12 Nov. 2009. ↑ Unofficial election results as reported in The Daily Progress [Charlottesville] 5 Nov. 1997: B3. Print. This page was last edited on 25 December 2017, at 12:09.